Catherine Denton: No Sugar? Wha--? Year of No Sugar caught my attention because it's something I would never do -- give up sugar for a year? No! I love my pancakes and brownies too much. So naturally, I was highly intrigued. 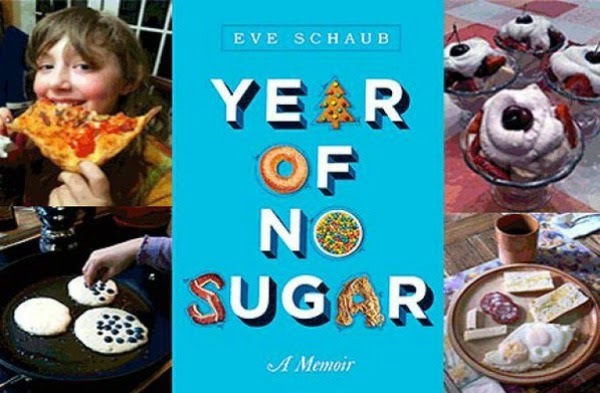 The author, Eve O Schaub, tells how her family abstained from added sugar for an entire year. Impressed that she talked herself into it, I was completely enthralled that she convinced her family to do it with her! I couldn't resist knowing how they survived, so I snagged a copy. I finished it in two days. Yeah. It was that good. Reading their story pricked my sugar loving soul. Her writing was so fun and engaging, dang it! I was in the middle before I realized she was changing my mind. I won't spoil her story for you but she has powers; I've gone three days without added sugar. And I'm a girl who can put a block of fudge away by herself! No sugar?? Oddly, it's not been as difficult as I imagined, but then again . . . it's only been three days. All I know is my happy little sugar world has been shaken; now it seems more bitter than sweet. This book is a delightful, humorous read full of foibles and honesty. She doesn't preach, but her story is persuasive and compelling. As for your relationship with sugar, well . . . consider yourself warned! Hmmm...how does one get through Christmas with no sugar? That's the big question for me!